Week-long efforts to educate campus communities about particular social justice issues is a growing trend in Catholic secondary education. The following is a resource that highlights the ways that Jesuit high schools have used to this strategy to form students “commitment to doing justice. Scroll below for tips on organizing a social justice week from the St. Peter’s Preparatory community who recently hosted their 17th annual Arrupe Lecture Series. Scroll to the bottom for links to Jesuit schools’ social justice week pages. 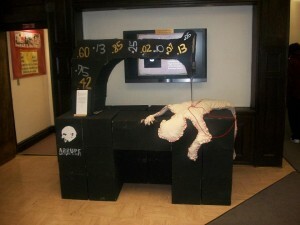 Sculpture created for the St. Peter’s Prep’s social justice week focused on workers’ rights. Plan early – put together a committee before the end of the preceding school year. Think broadly – choose committee members who represent diverse student interest groups. Foster long-term learning – invite teachers and faculty into planning to initiate later classroom involvement. Think local – consider themes which directly impact your local community. Go beyond – consider local themes from a global perspective. Ask – what topics will encourage student interest? student dialogue? Approaching controversy – do not be afraid to be counter-cultural. Use your resources – utilize student and faculty speakers to share personal witnesses. Start small – begin connecting with student campus ministry group, word spreads! Foster learning – provide resources for students to engage with related materials during weeks prior to event. Give choices – plan elective breakout sessions, smaller groups of students led by various guest speakers. Extend involvement – plan field trips or other after-school activities to give opportunities for first hand experience. Gather opinions – consider conducting a pre-event survey to gauge levels of prior knowledge of topic. Make accessible – connect with school librarian and other media sources to provide educational materials by department. Advance interest – provide curriculum resources early, allowing teachers to incorporate theme into the classroom experience. Encourage creativity – focus on involving art and music departments to encourage students to go beyond only academic reflection. Give incentive – involve teachers in providing classroom encouragement for student attendance and involvement. Communicate – utilize email and newsletters to outline theme and events; provide parents with online videos and other resources. Handling controversy – invite parents into dialogue on themes, speaking from the lens of Catholic Social Teaching. Encourage involvement – consider hosting a parent theme night to give a look into weekly student events. Journal it – provide a reflection sheet with questions for students to take notes on throughout the week. Create a discussion space – on the day of keynote address, provide time for each homeroom to meet and discuss stories heard. Gather feedback – gauge from teachers student reactions and quality of discussion. Reflect together – 2-3 weeks after event, meet as a committee to discuss what went well and areas of improvement. Be patient – recognize growth takes time. Stay educated – maintain a resource page of speaker bios, videos, and a further reading list. Call to action – post a list of potential theme-related service opportunities and advocacy materials. Click on the images below for more information about the social justice weeks hosted by Jesuit high schools throughout the United States and Canada. Websites include schedules, speaker information, theme ideas, resource pages, and more.